Two surveys conducted by different Palestinian pollsters in October show unexpected popular flexibility on core issues of an eventual peace deal with Israel, despite widespread skepticism among Palestinians about current prospects. These findings suggest that American, Israeli, and Arab policymakers should all pay more attention to what the Palestinian people really want and less attention to what their politicians or partisans say they “should” want. [….] Two-thirds of Gazans say Palestinians should accept that the “right of return” not apply to Israel, but only to the West Bank and Gaza, if that is the price of a Palestinian state. A survey found that 81 percent of American Jews feel same or more positively towards Israel over last 5-10 years, and that 65 percent are largely unaware of controversies over religious pluralism. 54% of West Bank and Gaza Palestinians reject the creation of a Palestinian state on the 1967 borders as a final solution for the Palestinian cause; 71% reject such a solution if it includes land exchange; 77% reject the creation of a binational state for both Arabs and Jews. It’s true that the issue has become politicized. But Americans are far more divided on the Israeli-Palestinian conflict than they are on Israel itself. Support for the two-state solution stands at 46% among Palestinians and Israeli Jews. Majority of respondents see divide between Jews and Israeli Arabs as the greatest danger to Israeli society. Sixty-seven percent of Jewish youth define themselves as right-wing (or center-right), while just 16% consider themselves to be left-wing. Western statesmen and politicians have long asserted that the two-state solution commands majority support on the ground. Most Palestinians say otherwise. Willingness to agree to a withdrawal from the West Bank as part of a peace agreement declined from 60% in 2005 to 36% in 2017. Support for the Clinton Parameters proposed by President Bill Clinton in December 2000 declined from 59% in 2005 to 29% in 2017. 59% of West Bank and Gaza Palestinians oppose the creation of a Palestinian state on the 1967 lines as a final solution for the Palestinian cause, 73% oppose the creation of a Palestinian state on the 1967 lines with some land exchanges, and 79% reject the creation of a binational state for both Arabs and Jews. Most Israelis and Palestinians would support a two-state solution, but falsely believe that most others around them reject this model. 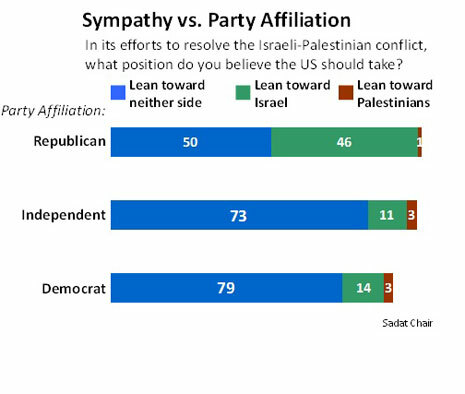 As has been the case for decades, the American public expresses more sympathy toward Israel than the Palestinians. Just over half of Americans (54%) say that in the dispute between the two they sympathize more with Israel, while 19% sympathize more with the Palestinians; 13% volunteer that they sympathize with neither side and 3% sympathize with both. In 2013, 86% of Israelis aged 20 and above were “very satisfied” or “satisfied” with their lives – 89% of Jews and 73% of Arabs, according to a report by the Central Bureau of Statistics released Wednesday. Americans’ views about the Israeli-Palestinian conflict remained steady over the past year, with 62% of Americans saying their sympathies lie more with the Israelis and 15% favoring the Palestinians. From a normative perspective, too, Palestinian attitudes are clearly maximalist. In the West Bank, 81 percent say that all of historic Palestine “is Palestinian land and Jews have no rights to the land.” In Gaza, that proportion is even higher: 88 percent. Although Iran cannot be counted out as the long-term popular champion of the Palestinian cause, a new poll indicates that the Palestinian street is up for grabs. American voters support 58 – 33 percent the preliminary agreement with Iran to restrict that country’s nuclear program, according to a Quinnipiac University National poll released today. At the same time, only 35 percent of voters are “very confident” or “somewhat confident” the agreement would prevent Iran from developing nuclear weapons, while 62 percent are “not so confident” or “not confident at all,” the independent poll finds. In a survey of American Jewish college students more than half of Jewish students at 55 campuses nationwide reported having experienced or witnessed anti-Semitism on their campuses during the last academic year. Survey by Palestinian Center for Public Opinion also finds that 59% of respondents believe Hamas-Fatah unity will last this time. Some 76% plan to enlist and 70% self-identify as Zionists, according to poll of Israeli teens • Some 85% are unwilling to give up parts of Jerusalem, even in exchange for real peace with the Palestinians. The Israeli public shows a high level of skepticism about the motives and considerations of U.S. secretary of state John Kerry in attempting to reach a framework agreement, and the measures taken so far do not appear to have had a favorable effect. [….] A large majority (74%) of the Jewish public is convinced that the Americans are exerting more pressure on Israel than on the Palestinians to accept the secretary of state’s framework agreement, even though its details are not yet clear. [….] Two-thirds of the Jewish public does not trust Kerry’s framework agreement to take account of Israel’s security as a crucial factor. More than 50% define themselves as right wing and don’t trust the Palestinians, yet would vote for a new Netanyahu-led centrist party. Even “after the establishment of an independent Palestinian state and the settlement of all issues in dispute,” Palestinians still rejected “mutual recognition of Israel as the state of the Jewish people and Palestine as the state of the Palestinian people,” by a majority of 56 percent to 43 percent. In short, even after all other issues are “resolved,” Palestinians still refuse to recognize the Jewish people’s right to a state of their own. So what exactly does it mean that Palestinians “support a two-state solution”? The same thing it has always meant, as an unusually honest 2011 poll revealed: not two states living side by side in peace and security, but two states as a stepping-stone to Israel’s ultimate eradication. American Public Opinion on Iran, America Israel Public Affairs Committee (AIPAC), December 2013: A one-page summary of three national polls regarding American views of the Iran nuclear deal and support for economic sanctions. Poll: 62 Percent of Palestinians Justify Suicide Bombing by Jessica Chasmar, The Washington Times, September 11, 2013: 62% of Palestinian Muslims say that suicide bombing is often or sometimes justified “in order to defend Islam from its enemies,” according to a new Pew Research survey. [M]ost Israelis—Right, Center and Left—have concluded that security-driven peace supersedes peace-driven security. 61% of the Jewish population believes that defensible borders are more important than peace for assuring Israel’s security (up from 49% in 2005). Survey polling Israelis, Palestinians also shows most respondents oppose a one-state solution, in which Jews and Arabs share equal rights within the same country. The 2011 Arab Public Opinion Poll surveyed 3,000 people in Egypt, Morocco, Jordan, Lebanon, and the UAE in October 2011. Turkey is the biggest winner of the Arab Spring. Prime Minister Erdogan is the most admired among world leaders. 73% of 1,010 Palestinians in W. Bank, Gaza agree with the Hamas Charter quote, ‘hadith,’ about the need to kill Jews hiding behind stones, trees. Only one in three Palestinians (34 percent) accepts two states for two peoples as the solution to the Israeli-Palestinian conflict, according to an intensive, face-to-face survey in Arabic of 1,010 Palestinian adults in the West Bank and the Gaza Strip completed this week by American pollster Stanley Greenberg. Americans side with Israelis over Palestinians – Continuing a long-term trend, Americans sympathize more with Israelis than Palestinians by a 67 to 16 percent margin according to a CNN poll conducted in late May following Barack Obama’s May 19 speech on the state of the Middle East peace process. 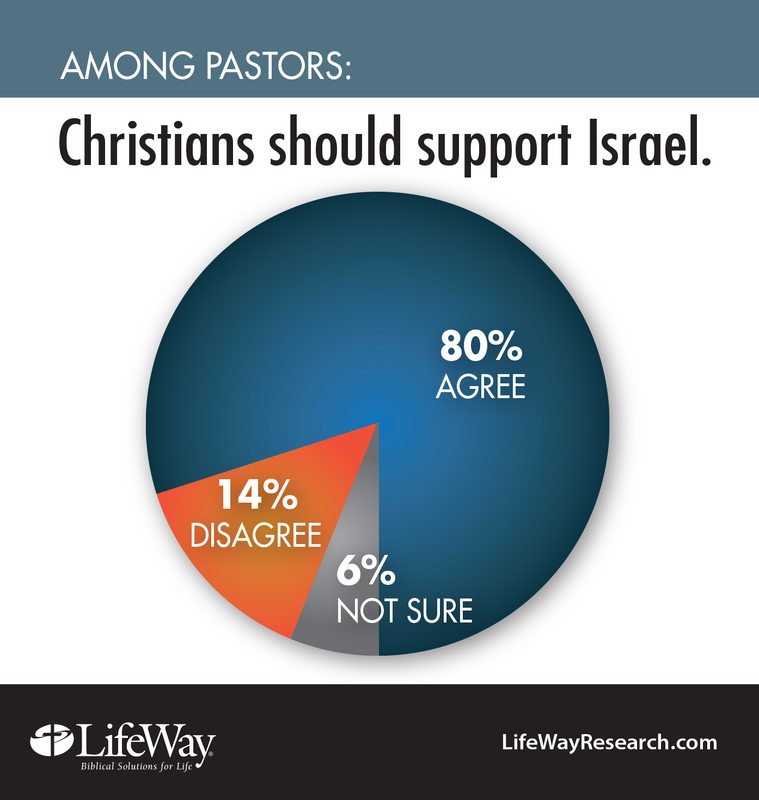 Sympathy with Israel is up slightly from 60 percent in 2009. At the same time, 65 percent of the public says the United States should not take either side in the Israeli/Palestinian conflict. Among the rest of the public, 35 percent say the U.S. should take Israel’s side while just 1 percent favors backing the Palestinians.